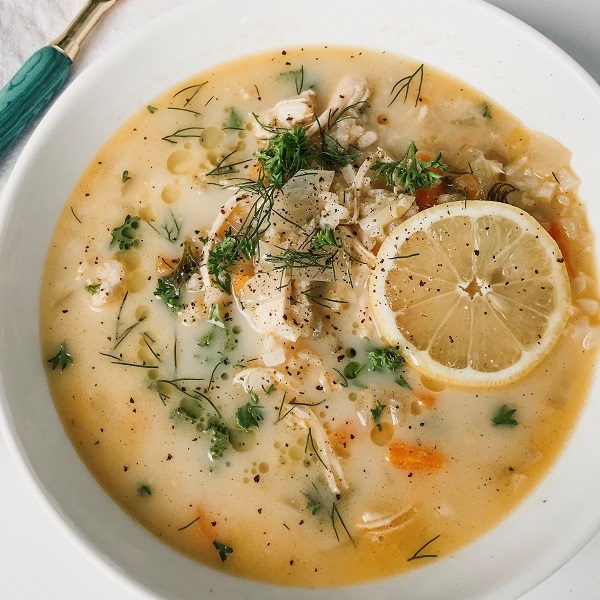 I made this in an Instant Pot but you can do it in a regular pot as well! Sauté your white onion, carrot and garlic in 2 tbsp olive oil over medium heat (or regular heat in your InstantPot). After about 5 minutes, add 2-3 cups cauliflower rice (you can use orzo or white rice just cook it separate and add it in at the end). Sauté for another few minutes then sear the chicken breasts for 2-3 minutes each side. Add the chicken broth, salt & pepper, and fresh dill and parsley. Pressure cook for 10 min or in a regular pot bring to a simmer and cook covered for 45-1 hour. Set aside 1 cup of hot broth and slowly add it to your egg yolks (1 tbsp at a time) while whisking vigorously. This prevents the eggs from scrambling when you add it to the soup! Remove the chicken, shred it and add back in with the juice from the lemons and the egg yolk mixture. Taste it and add more salt and pepper as needed. Serve with fresh parsley and dill and drizzle with a little olive oil!